In the hot, sticky days of summer it is natural to think of ice cream and cold drinks. It is also natural to opt for salads and raw vegetables to avoid cooking over a hot stove. But these habits can lead to poor digestion and a build-up of ama that could make one susceptible to allergies in August and September and cause fatigue and lethargy. Remember, when the outside temperature is hot, our own internal fire diminishes, and with it, our ability to digest food. Avoid iced drinks and food, especially with a meal. Slightly steaming your vegetables will allow you to pull more nutrients from your food. Eating raw vegetables requires a robust digestive fire. And, of course, follow the traditional Ayurveda recommendations for balancing Pitta: favor foods that are cooling and liquid. Minimize foods that are spicy. Increase tastes that are sweet, bitter, or astringent. Minimize foods that are spicy, salty or sour. 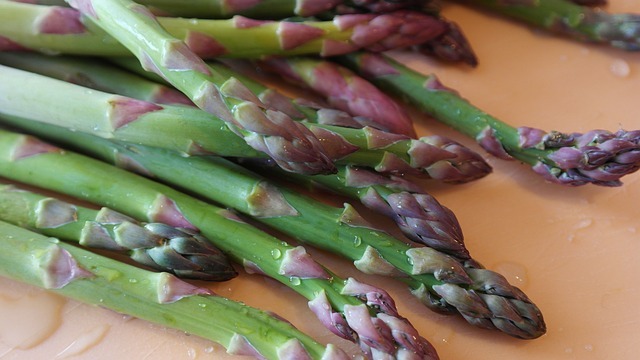 Steam your chosen amount of asparagus and/or carrots to a “fork friendly” quality. This means a little more cooked than “al dente” but not mushy. Then pour the following lemon-herb sauce over the vegetables. Put in blender with a few leaves of fresh basil and mint. Puree until smooth. Blanch peaches in boiling water. Remove skins. Blend raspberries and strawberries until smooth. You can add sugar or honey to the berries before you blend them, per your own taste. Spoon the mixture over the poached peaches. Garnish with mint leaf. Fibromyalgia is a chronic condition that affects an estimated 10 million people, mostly women, in the United States alone. It is characterized by widespread musculoskeletal pain, concentration issues, fatigue, sleep problems and mood swings. 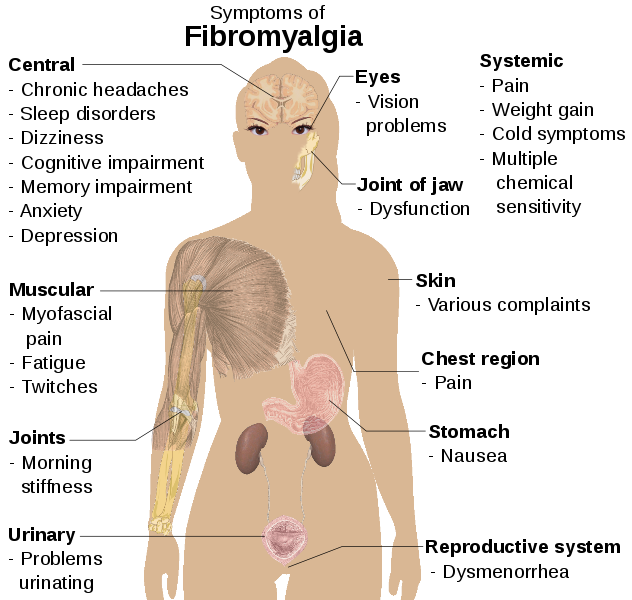 The severity of the symptoms varies from person to person. People who suffer from fibromyalgia are not actually more sensitive to stimulus than others. Research shows that those with fibromyalgia cannot detect electrical, pressure or thermal stimuli at a lower level than normal subjects. Those diagnosed with fibromyalgia have evidence of neurochemical imbalances in the last two areas of this process, the spinal column and the brain. In the spinal column, two biochemical, substance P and nerve growth factor, are four times higher in people with symptoms of fibromyalgia. These chemicals heighten the transmission of stimuli to the brain. Evidence also suggests that the normal inhibitory signals from the brain down the spinal cord are diminished in fibromyalgia, allowing stronger stimulation to flow up the spinal cord to the brain. There is also abnormal activation of the areas in the brain associated with pain. These imbalances both amplify the transfer of pain stimulus to the brain and decrease the normal inhibition of these signals, resulting in experience of pain at levels of stimulation that do not normally cause pain. Ayurveda brings a unique perspective to understanding fibromyalgia. The most common imbalance seen in Ayurveda is a disturbance of nervous system activity in the physiology. According to Ayurveda, the “Vata” principle controls the overall experience of excitation and activation of the nervous system. Fibromyalgia is a classic Vata-type imbalance. Ayurveda contains more information on how to treat a Vata imbalance than for any other type of condition. Ayurveda give extensive descriptions of the types of foods, behaviors and experiences that will imbalance Vata. This information helps and Ayurveda expert better understand what created the fibromyalgia condition in the first place and what factors could continue to worsen it. By understanding the root causes of fibromyalgia, it is easier to create a program to truly cure the condition. There is a saying in Ayurveda: “Without proper diet, medicine is of no use. With proper diet, medicine is of no need.” There are certain types of foods that imbalance Vata, create an overly activated and hypersensitive nervous system and thereby contribute to worsening fibromyalgia symptoms. For example, raw vegetables do provide freshness to the body but in excessive quantities they create indigestion and aggravate Vata. Also, heavy, hard to digest food, especially when eaten at evening meals, are very hard to digest and can create toxins that exacerbate fibromyalgia symptoms. On the other hand, fresh, sweet (not unripe or acidic) juicy fruits are very nourishing and balancing to the nervous system. Also, drinking ample quantities of room temperature to warm water throughout the day can aid the body in its natural cleansing and healing process. One of the most effective Ayurveda approaches to fibromyalgia is the classical series of herbalized oil massage and heat treatments, known as Panchakarma. These therapies help eliminate toxins and impurities from the system and are very helpful in increasing flexibility and often reduce pain. Also, the specific herbs that are used in the massage and heat treatments aid greatly in cleansing, balancing and nourishing the tissues that are most tender and sensitive to pain. Fibromyalgia often begins after some mental, physical or emotional trauma. Also, many individuals experience a worsening of their symptoms when they come under extra stress. For this reason, The Raj recommends the Transcendental Meditation (TM) technique to guests who are suffering from fibromyalgia. The body has a very powerful neuroendocrine response to perceived challenge, which is well documented to exacerbate many disorders. Because life by nature will always have some level of challenge, it is important to be able to help the body quickly return to its neuroendocrine baseline after stressful experience. In fact, from a medical point of view, stress in and of itself is not bad for the physiology. It is when the body is unable to restore biochemical balance after the experience of challenge and stays in a hyperarousal state, called a chronic stress response. TM has been shown to normalize the stress response, allowing stress hormones to spike rapidly in response to threat, and then go down quickly to a baseline level. The other day I was reading an article on the BBC period drama, Wolf Hall. Despite the lengths that the program-makers went to ensure historical accuracy, historians were finding fault in certain details. One detail (the straight white teeth of all the actors) was defended by Hilary Mantel, the author of book on which the series is based. Mantel insisted that a Tudor drama would be less accurate had it insisted on blackened teeth – as it was a time when sugar was yet to become widely available. Apparently, tooth decay was mostly a disease of wealthy Westerners prior to about 1840 when sugar became cheap. Most ordinary people had excellent teeth. Another wake-up call to avoid sugar. Sugar (or sucrose) is used by a bacteria found in the mouth (streptococcus mutans) to make a sticky polysaccharide glue that allows it to stick to the tooth surface and form plaque. Streptococcus mutans also makes lactic acid out of sucrose and other carbohydrates, and this acid dissolves the tooth enamel causing decay. It is this combination of plaque and acid that promotes dental decay. Sucrose is the only sugar that streptococcus mutans can use to form this sticky polysaccharide glue. Avoiding eating sugary foods and drinks and brushing your teeth after eating them is the best way of avoiding dental decay. Dental hygiene is specifically addressed in Ayurveda. The ancient texts mention using special twigs to clean teeth, so the original Ayurveda experts appreciated the value of cleanliness. The toothbrush and dental floss are our modern equivalents. Ayurveda also recommends gandusha, a sesame-oil gargle and sesame-oil massage of the gums. Oil is antimicrobial and when it penetrates the tissues of the mouth, it can inhibit bacterial growth and gum deterioration. While sesame oil is traditionally recommended, gandusha can be done with other oils as well. In vitro lab studies have indicated the antibacterial activity of edible oils such as coconut oil, sesame oil and sunflower oil. A new study was published in the Nigerian Journal of Medicine‘s March/April 2015 edition on the practice of gandusha using coconut oil. The research looked at 60 people between the ages of 16 and 18 who added the technique to their oral hygiene routine over a 30-day period. Their plaque and gum disease levels were assessed on days 1, 7, 15, and 30. After just seven days, levels of plaque and gum disease significantly reduced, and continued to decrease over a period of a month. First, fill your mouth as full as you can with warm water. Hold this for about a half a minute to a minute. Then spit it out. Next, fill your mouth as full as possible with warm sesame oil. Hold it in your mouth for about a half a minute to a minute. Then dispose of it. Take a little oil into your mouth and gargle for a half a minute to a minute. Dispose of the oil. Massage the oil into your gum with your finger. Be gentle but use enough pressure for the massage to be pleasantly invigorating. Take two or three minutes to do this thoroughly. Finally, if you wish, you can rinse your mouth with warm water to remove any oil residue. Please note: Although sesame oil is healthy for your gums, it can clog bathroom drains. Therefore it is a good idea to keep a small container handy to hold the used oil until you can dispose of it properly. Incidentally, while gandusha strengthens and purifies your mouth, it also improves digestion.